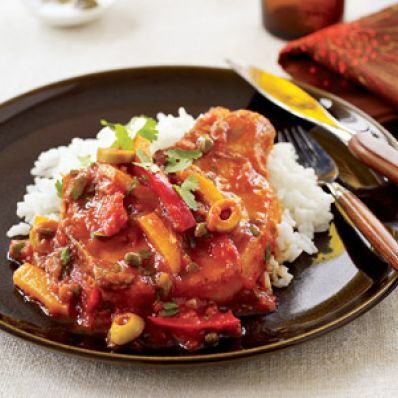 A combination of sweet peppers, jalapeno chiles, and olives give this quick and easy recipe for pork chops a Latin beat. If you can't find the alcaparrado, just add some sliced black and/or pimiento-stuffed olives. 1 of 3 Heat tablespoons vegetable oil in a large nonstick skillet. Season pork chops with salt and black pepper and saute over medium-high heat 3 minutes per side. Remove chops and add garlic, peppers and chile. Reduce heat to medium and saute 3 minutes, stirring occasionally. Stir in alcaparrado, marinara sauce and water. 2 of 3 Bring to a simmer and add pork chops. Cover and simmer on medium-low for 30 minutes, basting occasionally. 3 of 3 Stir in chopped cilantro and serve with cooked white rice.